Thank you for visiting my site dedicated to my favorite band, Guns N' Roses. I started creating this site quite some time ago. After spending some time researching and visiting other GNR sites, I decided that just about everything that could be done, has already been done. Therefore, I am not going to create another site with pictures, lyrics, etc. Rather than removing my site, I have decided to leave it as a gateway to the Top 100 GNR Fan Sites which I am the list owner of. If anyone would like to create a logo for others to use on the GNR top sites or would like to donate a logo they currently use on their site, please send it to roses_no_guns@yahoo.com. I will credit you so please include a link to your site if you send a logo and I decide to use it. Please keep them small! For additional logos created by fans, click here. Top 100 Guns n' Roses Fan Sites! Think your site is great? Prove it! View the 100 best sites! Guns n' Roses - Another Unofficial Site! 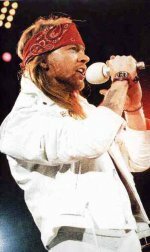 What was Axl Rose's Birth Name? Guns n' Roses - Another Unofficial Site! What is your favorite GNR song? Guns n' Roses - Another Unofficial Site! Where was Axl Rose Born?